Share this product and receive a $1.65 sharing discount. 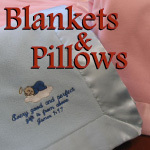 This receiving blanket is very soft and cozy and is made of minky dot and satin fabric. Currently it is only available in blue. This design has been embroidered with 'I am wonderfully made. Psalm 139:14.' The blanket measures approximately 28 inches by 33 inches, and each includes an organza ribbon. Blankets are machine washable and dryable. Shop for a companion cross below... perfect to top off this baby gift.